Posted by Brendan Samuels on February 6, 2018 in Basketball, Sports, Top Dawg. 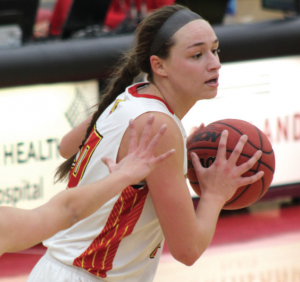 The Ferris women’s basketball team is coming off a huge 78-67 victory over GLIAC opponent Saginaw Valley State University (SVSU), thanks in big part to senior forward Rachel McInerney. McInerney was on fire Saturday, Feb. 3, when the Bulldogs took on the Cardinals, nearly recording a triple-double. McInerney put up 31 points, 18 rebounds and recorded eight blocked shots. The Dawgs’ matchup with SVSU wasn’t the first time that week that McInerney dominated the hardwood, as she put up solid numbers on Thursday, Feb. 1, in Ferris’ 77-69 loss to the Timberwolves of Northwood University. McInerney totaled 22 points, 10 rebounds and added three blocked shots as well in the Bulldogs’ loss to the Timberwolves. The women’s team has been much improved this season, posting a 12-10 overall record with a 6-8 GLIAC record. With the win over SVSU, the Dawgs currently sit at sixth in the conference and could use some big wins to propel themselves forward come Tournament time. McInerney and the Bulldogs will be back in action at 7:30 p.m. Thursday, Feb. 8, when they head to Tiffin, Ohio to take on the Tiffin University Dragons. Click here to see the two Bulldogs from the hockey team who took home last week’s Top Dawg honors.